Usually segments in this series are posted on Tuesdays but I wanted tonight's red-tailed hawk event hosted by the Greenwich Village Society for Historic Preservation to be fresh in your minds. The program details follow. 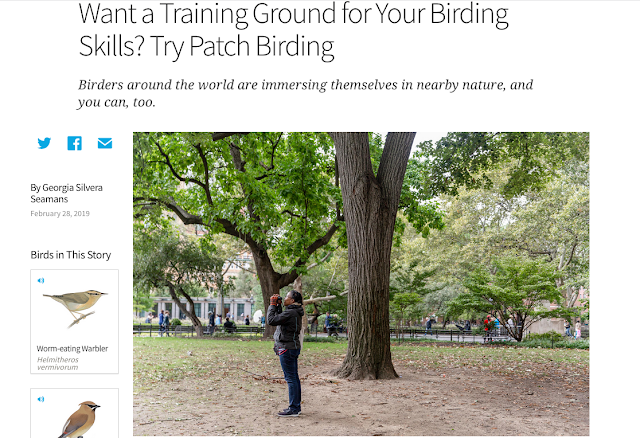 Gabriel Willow is a naturalist, guide, and educator with New York City Audubon, who will describe the nesting, mating, and hunting habits of these predators, and explain why we should welcome them to our neighborhoods. To register, please call (212) 475-9585 ext. 35 or email rsvp @ gvshp.org. The shrill cry you hear when you see a bird of prey onscreen is almost always that of a Red-Tailed Hawk. It is this cry that, when heard while alone and in the wilderness, reminds you that you are indeed alone and in the wilderness. One of the largest birds in North America, the Red-Tailed Hawk is sometimes called a Chicken Hawk. Call it that at your own risk, though, this is a really big bird: Red-Tailed Hawks can typically grow up to 26 inches in length with a wingspan of up to 57 inches. The Red-Tailed Hawk's preferred habitat is mixed forest and field, but it can be found almost anywhere, from Alaska and the Yukon on down to Central America, north to south, coast to coast. Red-Tailed Hawks can live in deserts and even urban areas. Yes, they can make it in New York, and you can too. 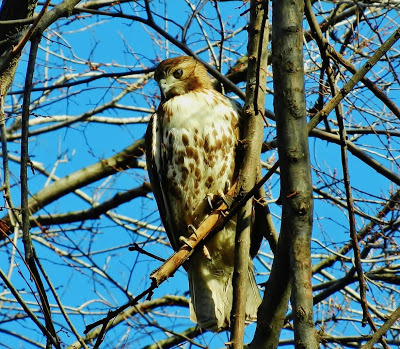 The Red-tailed Hawk has adapted well to man-made changes in habitat, using cleared areas for hunting and wooded areas for nesting. Telephone poles make a great perch, as do high bluffs and trees. Red-Tailed Hawks are monogamous and often mate for life. Do not attempt to hug a Red-Tailed Hawk. Most likely it is already spoken for and also, Red-Tailed Hawks are notoriously bad huggers. Red-Tailed Hawks are known for their brick-red tails, but not all of the 14 subspecies of Red-Tailed Hawks share this coloring. Most have some red in their tails but they are commonly distinguished by their tail markings, size, and the coloration of their undersides. Did you notice the image behind the canister of tea in the above photograph? 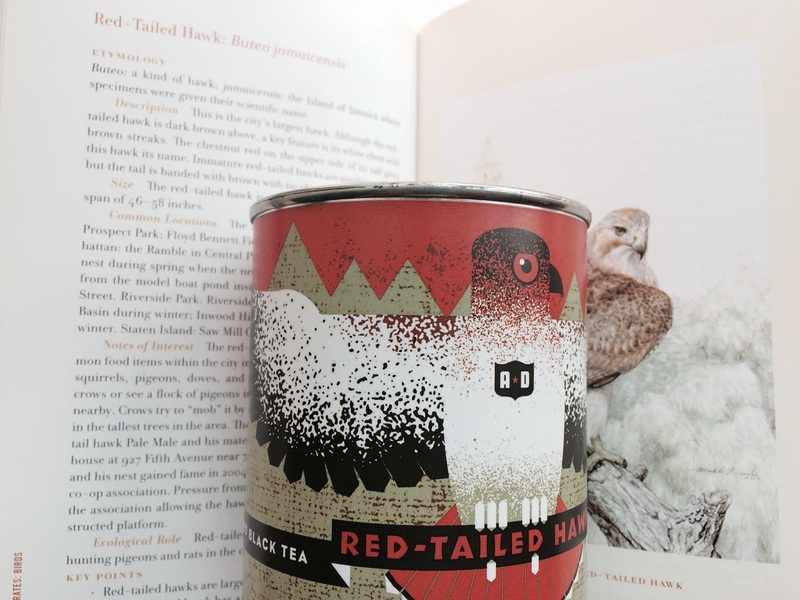 It is the red-tailed hawk page in Leslie Day's Field Guide to the Natural World of New York City. Leslie led a fall foliage tour in Washington Square Park. On May 8th, she will lead a Spring Nature Walk in the park. Register here!